3 U. S. V. Inf. According to his death certificate found on FamilySearch, Cullen's full name was Cullen Edward Grant. 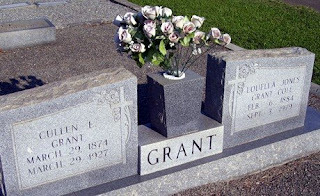 He was the son of J. T. Grant, and he was born in White Plains, Georgia. Cullen's occupation was listed as farmer. 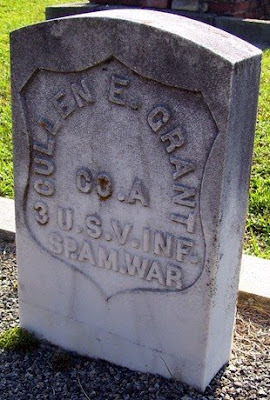 His place of residence at the time of his death was Unadilla, Georgia, and he was the husband of Louella Grant. Phil C. Grant, Cullen's brother, was the informant. Cullen Edward Grant died at the U. S. Veterans Hospital in Atlanta, De Kalb County, Georgia. He was admitted on the 23 of March 1927, and his date of death was given as 30 March 1927 (a day off of the death date on his tombstone). 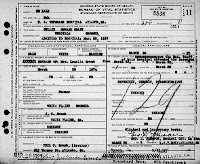 Cullen's body was released for burial in Byron, Georgia 31 March 1927. I have a special place in my heart for the great state of Texas. We lived there for a few years when I was younger. A cemetery blog for there would be of definite interest to me... FindAGrave is awesome. I contribute when I can. Thanks for visiting my blog!